I remember Charles Busch performing his plays at the Limbo Lounge on Avenue B and asking the audience afterwards, “Did you ever think you’d go this far east in your life?” It was scary over there. But New York is different now, and John Zorn has this hangout, The Stone, on Avenue C (you heard me) at Second Street, a performance space the size of a largeish dorm room. And thus the whirligig of Time brings in his revenges. Among The Stone’s resident artistic groups is a “composer collective” intriguingly named “Experiments in Opera,” who recently commissioned eleven composers to write songs for James Ilgenfritz’s Anagram Ensemble. 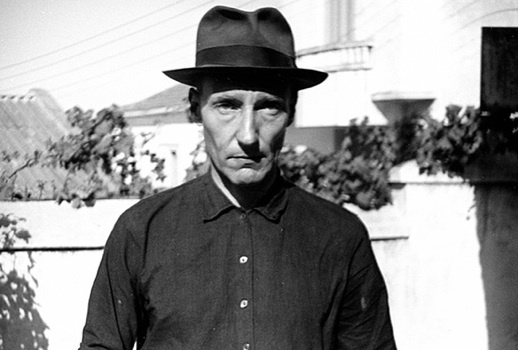 The texts were poems from William S. Burroughs’ The Travel Agency Is On Fire. Except Burroughs didn’t really write these words; he cut up other guys’ texts and rearranged them as “cut-up”s, a technique partly responsible for his surrealistic novels, such as Naked Lunch and The Ticket that Exploded. Does anyone still read Burroughs? Well, Ilgenfritz has released a CD opera, The Ticket that Exploded, but I don’t know it. In the text Ilgenfritz set for Friday’s concert, “I Kiss the So-Called Dawn” (from Rimbaud), the musicians, aside from percussive interjections, “played” the singers at will, thumping parts of their bodies (usually back or diaphragm) while they sang. That produced thrumming on certain words; my favorite was “raining,” which sounded like droplets on a Parisian café awning. Faced with these assignments, the eleven composers went every which way but straight along the road. The musicians included violins, a double bass, an electric guitar, a vibraphone and assorted percussion, played with enthusiasm. Four singers, in various combinations, sang something or other. Words at times. Or grunts. Or murmurs. Or sighs. Lots of sighs in Travis Just’s “Kiss Me,” a Shakespeare cut-up. One of the sonnets? I couldn’t tell. (Didn’t Tristan Tzara do things like this?) Some of the words were “dwell” and “melting.” Full sentences were rare all night. All the singers (and musicians) were amplified, but they sounded good anyway when they had occasion to. There was a lot of street noise from outside (curses, entreaties, sirens) that fit right in. Each song was introduced by a taped statement (mercifully brief) from its composer, explaining where they came from, instrumentally (bassoon? French horn? pedal steel? among others), and something about where they wanted to go. Happily, the songs were self-explanatory or self-incriminating. Incomprehension may be blamed on Bill Burroughs, though I think he’d have liked that. Incomprehension, for me, was greatest in Katie Young’s setting of a Kerouac cut-up, “real real real red,” wherein Burroughs rearranged the words alphabetically. Thus the first line was “a a a a a a” followed by “and and and and and,” and after that I just sort of endured it. In “Out Of Man,” Charlie Looker’s setting of Jean Genet, the singers growled a lot of words, including obscenities and observations of obscenity, in which the vocal technique clashed with sentiment to convey the writer’s ire and wit. Anne Guthrie’s setting of a Scott Fitzgerald text, “Even the Stains Pale,” conveyed a serene mood with lyrical electric violin riffs. Jason Cady’s setting of “Cut Up With Catcher in the Rye” focused on Holden Caulfield incoheren, stream-of-conscious disgust. JG Thirlwell drew the final spot, “The Travel Agency Is On Fire,” a cut-up of Anthony Burgess, that built artfully to an entertaining climax and sent us out humming, sighing, splattering, in a mood to jam. You know? On such a program, this jolly conclusion can’t be as easy to produce as it seemed. The prettiest voice of the evening, or the one most often permitted to be pretty, belonged to tenor Nathaniel Adams, a pure, even sound he usually deploys in medieval or Renaissance music—good training for the crazy demands of modern composers. Soprano Megan Schubert, who specializes in contemporary performances, was assigned more declamatory duties but when she had the chance produced lovely, languid phrases. Amirtha Kidambi, a soprano given to jazz and “improvisation,” drew the melodramatic assignments in Genet and Burgess works and performed with thrilling intensity. Michael Douglas Jones, a bass, did not seem much discomforted by a high-ish tessitura, but then he also had more to declaim or sigh than sing.